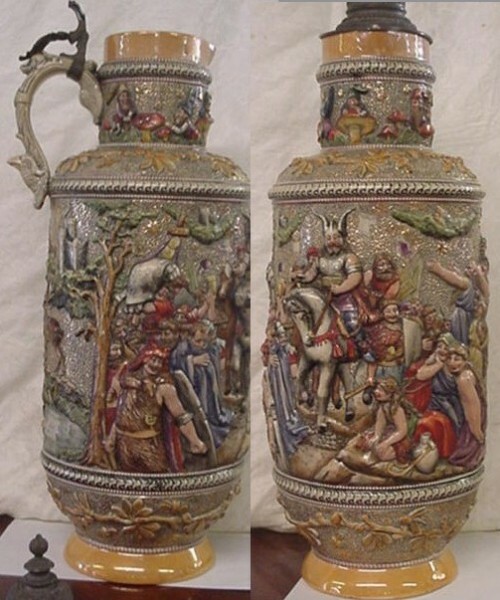 “I wish you beer stein collectors would learn this one easy German history lesson! I am a German! I am a good old German, an “Alt Deutcher! I am famous in my homeland. It is a shame you Americans can not call us old timers by our correct names, but then you are the ones that started calling our stoneware bier krugs, “steins,” are you not? In German to English, my name Armin was interpreted as “Hermann” by Martin Luther and to distinguish me from other Germans of the same name, I was called “Hermann “The German.” As I said before I’m pretty famous in Germany. 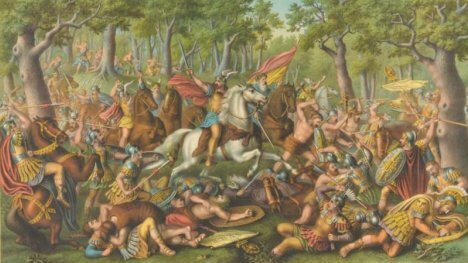 My warriors, now known as the Cherusher or Cheruscans along with several of other Germanic tribes “whipped the snot” out of three Roman Legions with their supporting units of Cavalry and auxiliaries at the famous battle of “Teutonburg Forest” in what is now northern Germany. We killed 20,000 top of the line Roman soldiers back in 9 A.D.! The Roman Emperor, Augustus Caesar on hearing the news of the great defeat, yelled out (and probably wept), “Varus, give me back my legions!” And hundreds of years later my countrymen were still calling me, Hermann, “Befreier Germaniens”, or the “German Liberator.” But some of you 21st century “E-nerds” still persist in calling us “Vikings.” Now if you don’t want to acknowledge that we are of a great German heritage, hen call us “Teutons” or “Nordics”, or call us the “Cherusci”, the official name of my tribe, but please stop calling us Vikings! A 1698 version of Hermann; quite the savage, hey? And one has just got to love that pony tail. 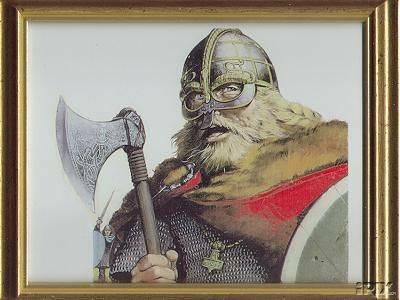 A representation of what a real Viking looked like in battle gear. 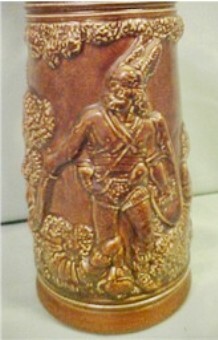 A pottery flask, German Ca. 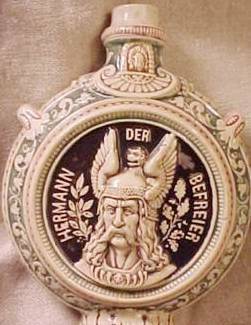 1900, showing a profile of Hermann wearing his famous winged helmet. 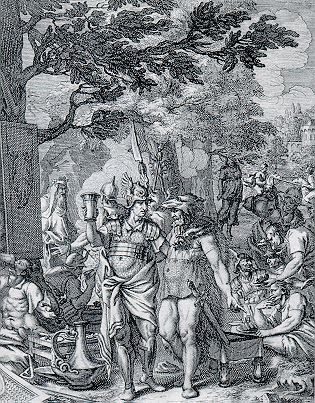 Hermann, who was a leader of one of the Roman auxillery units is shown with his leader, Roman General Varus, who he later betrayed. It was said of the battle where we creamed the Roman General Varus and his troops: “Nothing was bloodier than this “Gemetzel” (butchery / carnage) in sumps (swamp / bog) and forests.” (3) But still you beer steiners don’t quite comprehend. The loss of three entire legions under “Publius Quinctilius Varus was one of the, if not the greatest military disaster in Roman History. Hermann, who was a leader of one of the Roman auxiliary units is shown with his leader above: , Roman General Varus, who he later betrayed. A historical poll completed in 2001 asked the question: “which best describes Arminus (Hermann? )” Of the 101 votes cast, ‘Freedom Fighter’ got 34%, ‘Military Genius’ got 24%, ‘Schemer’ got 24%, and only 12% thought I, Hermann, was a traitor, which I am certain my leader, General Varus thought! There is a statue of me, called the “Hermannsedenkmal”, that does show me wearing a winged helmet. It honors the memory of the battle I have been telling you about. Ernst von Bandel erected the 385 meters high monument (above sea level) in 1875, but he was not particularly interested in historical accuracy but in finding a “correct and pleasant” surrounding. These he found on the “grotenburg”, at the gates of the traditional town of Detmold. 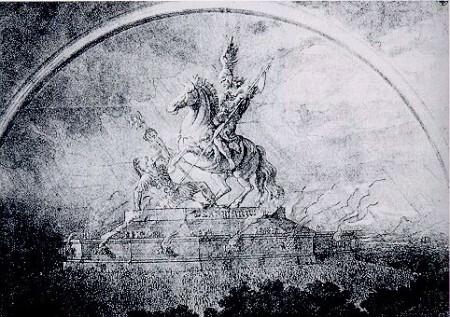 (7) The date of building that statue dedicated to me gave the “bier krug” makers plenty of time to use his artistic license of the winged helmet that had been previously established by Richard Wagner. Oh, but now I get ahead of myself. 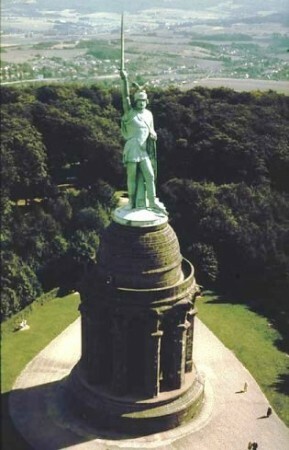 The statue of Arminus, called Hermannsdenkmal” is close to the town of Detmold, built by Ernst von Bandel in 1875 to honor old Hermann. It was not Hollywood’s rendition of the “Vikings” that has caused this major misunderstanding of the winged helmets. Probably more to blame then “those dudes” is the much earlier form of entertainment, the opera! Richard Wagner (1813-1883) and his theater’s set and costume designers did more to unconsciously establish the dress of the “Old Germans” in the Nordic style of the Scandinavians than anyone else. 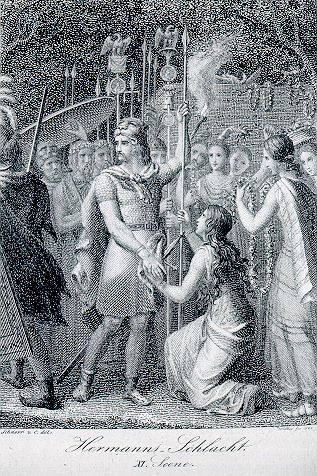 The Nordic myths of Siegfried and Brunnhilde especially fascinated Wagner. 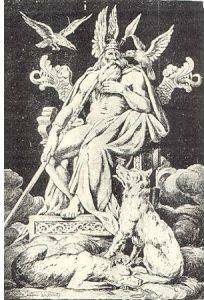 He decided to use the tales as a basis for four epic operas to be performed under the title “Der Ring des Niebelungen.” Wagner referred back to those Norse tales when he comprised “Der Ring……” He combined the Norse Saga of the Volsungs with the German epic, the Nibelunglied. Steve, my friend and German Krug collector has a theory and he admits it is hard to prove over 150 years later, but I Hermann, will advance it anyway. Steve believes Wagner got this costume ideas from a book that had been published and widely read in 1836. It was called “The History of the German People, ” authored by Carl Mayer – and to Steve’s, very limited knowledge and research in this subject, was one of the first times Hermann is seen wearing a winged Helmet. 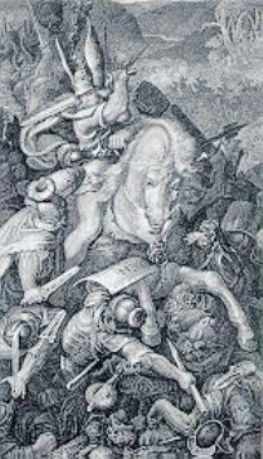 Carl Mayer’s print of Hermann, the warrior with the helmet. Years later , by the time the final episode of Wagner’s “The Ring” series had been produced and many editions of “The History …” had been read, the German ideal of what the daily garb of the old Germans has been well established. Of course the winged helmet of the fearless leaders tagged along. It was a short hop from those book illustrations, as well as the opera posters to those images produced in the beer stein workshops of an industrial Germany, The rest as they say is “Beer Stein History. As one can see by the photos in this article , I , Hermann, have been represented on many “alt Bier Krugen.” On some of these vessels the makers even put the words “Alt German” on them , and you collectors wil still look at these steins 100 or so years later and say,……(you guessed it) … Vikings . 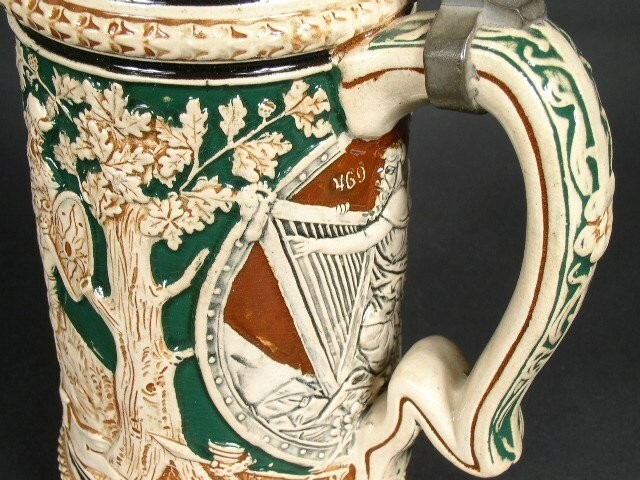 I am sometimes shown on these steins as wearing an animals hide (mostly a bear’s) as a head and neck protector. A woodcut from 1717 [? 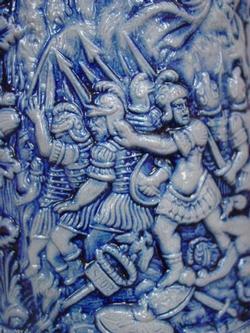 ], showing Hermann and his troops dressed, but not as Barbarians. Of note, not a winged helmet anywhere! SPQR” , stands for “Senatus Populusque Romanus.” (“The Senate and People of Rome.”) This Latin motto of the Ancient Roman Empire that sounded imperial glory for millennia. Hermann wearing a Bear’s skin head dress along with Roman style attire, shown on a copper plate print, dated 1823. 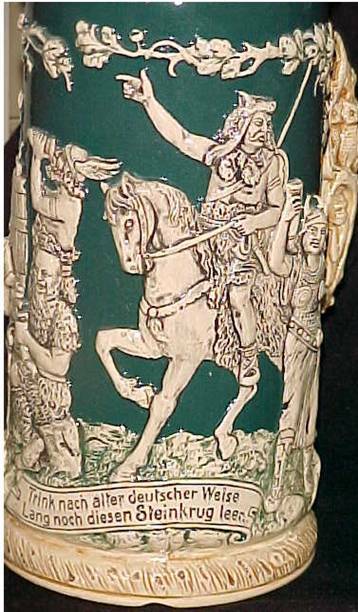 A 1/2 liter porcelain stein showing Hermann, taken from Mr. Thumann’s painting. “With coats of mail very few are furnished, and hardly upon any is seen a head-piece or helmet.” [Per: “Internet Medieval Sourcebook”]. (7) http://www.hermannsdenkmal.de/region.htm. The actual site of the battle has now been accepted as being some 50 miles NW of where this monument is. This is due to serious archaeological excavations taking place in the last 20 years. (8) Various “Google” web sites. CREDITS:  Editorial review assistance by Barney, “Gambrinus Stein Club”. My thanks to Les Hopper (SCI – Deceased), for his web site, for providing translations used: http://members.cox.net/leshopper/expndx.htm EDITOR’S NOTE: This information has now (2010) been put behind locked doors in the “Members only” section of The SCI web site! What a damn shame! This article is dedicated to my old friend and fellow collector (Gambrinus Stein Club) Jack Gusted, who started me on this project years ago by writing his brief explanatory article about Hermann in “PROSIT”. 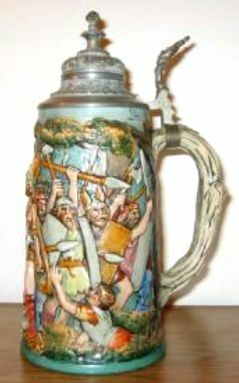 OTHER BEER STEINS SHOWING HERMANN AND THE BATTLE, OR HIM AND HIS MEN, OR WIFE. 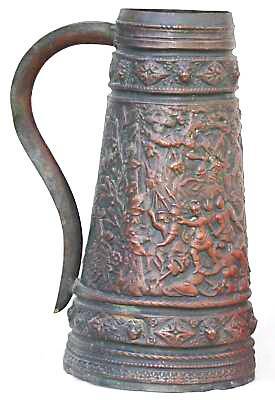 A .3 liter pottery relief stein. Hermann [probably], his horn and his spear. Circa 1900. A newer .5 liter (1970- 2000) version by “King. 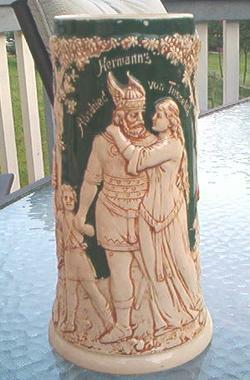 Hermann and his wife ‘Trusnelda’, shown on a half-liter cream and green potter relief beer stein. Circa 1890. A massive 4.5 or 5 liter salt glazed stoneware serving stein. wrap around battle scene. Made by Hanke i believe. 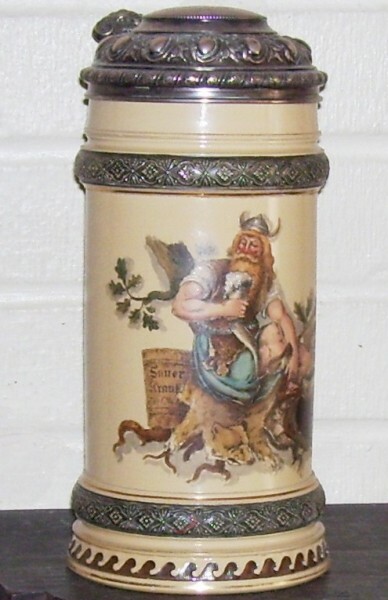 A 21.5 inch tall serving stein by Diesinger, from Thumann’s painting. 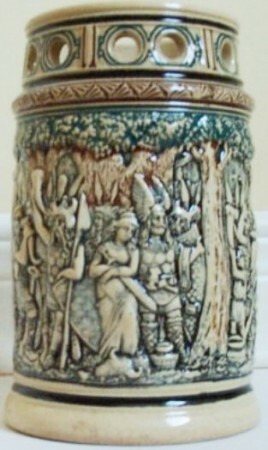 A 4.5 liter pottery serving stein showing Hermann and Trusnelda’s elopement. His father-in-law was not happy! Much later her father gave the Romans (seeking revenge for the Varus disaster) his daughter’s and Hermann’s location. She and her son were caught and taken to Rome where they were paraded as war prizes. Hermann escaped the Romans to fight another day, only to be later knifed to death by his own tribesmen. BELOW: Additional info that was added after the article was written in 2006. 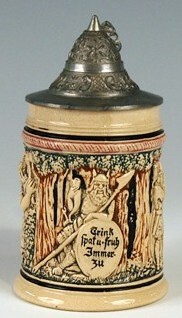 With a few additional photos of Herr Hermann on beer steins. 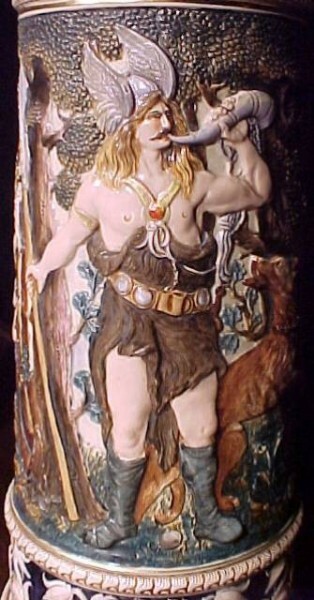 A hand painted scene of Hermann and his drinking horn. This is on a .5 liter V & B Mettlach, which comes with a silver plated lid made by WMF. The painting is reminiscent of a “van Hauten” piece, but there is no signature. A half liter pottery stein with a ‘false bottom’ Circa 1900. A little known fact, but all Germanic tribes had harpists. It was a high position in the tribe, sort of a “right hand man” to the Chief. Sometimes the Harpist was used for ambassadorial mediation functions with other tribes. “Even the latest of these archaological finds, with one exception, are a century or two shy of the Viking Age proper, which is somewhat arbitrarily reckoned to have started in A.D. 793, the year of the Viking raid on Lindisfarne. The exception is the horn-wearing man depicted on the ninth-century Oseberg tapestry discovered in Norway a hundred years ago. It may represent a continuation of the pre-Viking ceremonial use of horned headdress by the Norse. That wouldn’t be too surprising; Norse culture didn’t radically change in 793. On the other hand, it could be a new custom imported from the east. Herodotus reported that the Thracians, the prototypical steppe barbarians to the ancient Greeks of his day, wore horned helmets. It’s possible the Vikings encountered something of the same sort in their travels through Russia or elsewhere in the east. The first image of horned helmets to be found was an engraved horn from Gallehus, Denmark, discovered in 1734. However, European artists had begun portraying ancient (pre-Viking) Germans wearing horned helmets as early as 1616, on the authority of the ancient writers. Since the ancients weren’t clear on the ceremonial purpose of the helmets, they were often used in battle scenes. The use of horned helmets in German heraldry during the Middle Ages can probably be attributed to the same authors. How did the priests’ headdress get transferred to intrepid Viking warriors? Blame artists, not archaeologists or historians. The Viking got his horned and winged helmets during the Romantic period (late 1700s to mid-1800s). Romantic artists rejected the constraints of Classicism and started to explore, among other themes, ancient Germanic and Celtic history and mythology. These artists weren’t always careful about the details and sometimes depicted a hodgepodge of Germanic, Celtic, and classical motifs. (Would you believe a Viking driving a chariot?) Romantic artists gave Vikings Celtic-style winged helmets before they got horned ones. In the 1820s the Swedish artist Gustav Malmström was the first to give horns to Vikings, as opposed to pre-Viking Germans like the Cimbri. He did so in illustrations for an edition of Frithiof’s Saga (1820-25). This Swedish poem by Esaias Tegnér was based on a poor excuse for an Old Icelandic prose saga written at a time when the once great saga tradition was beginning its long sad descent into what E. V. Gordon called the “turgid monotony of the fourteenth-century tales of kings, queens, and knights in fantastic adventure.” Tegnér’s sappy reworking was unaccountably popular and influential around the world. The various English translations were largely responsible for popularizing the word Viking in English. Where did Malmström get the idea for a horned helmet? By the time the poem came out, plenty of archaeological evidence indicated that horned headgear was used in ancient times, although it still wasn’t clear that such helmets were purely ceremonial and may have disappeared before the Viking era. At any rate, Malmström’s idea didn’t catch on right away. While the illustrations for some English translations of the poem also featured horned helmets, the winged variety remained the norm for several more decades. Horned helmets were given a boost by amateur archaeologist Axel Holmberg, who in the 1840s and ’50s assigned to the Viking Age a rock carving that depicted men wearing what he claimed were iron helmets with attached ox horns. In fact the carving dated to the Bronze Age (no later than 500 BC), and only Holmbergcould discern what material the horns were made of. His ideas didn’t do much to popularize the idea among artists or the public, but quite a few archaeologists and historians were hornswoggled for a while. The professionals eventually came to their senses, but by then horned helmets had become common on Viking heads in art. “In Wagner’s operas, horned helmets are now most closely associated with the Valkyries, but as originally staged the Valkyries wore helmets with wings. (The Valkyries didn’t get horny until Wagner died.) The only major figure in the whole cycle who wore a horned helmet in the early productions was Hunding. Those who have somehow managed to stay awake through the entire four-hour production of Die Walküre may remember Hunding as the boor who objected to his wife sleeping with her brother. 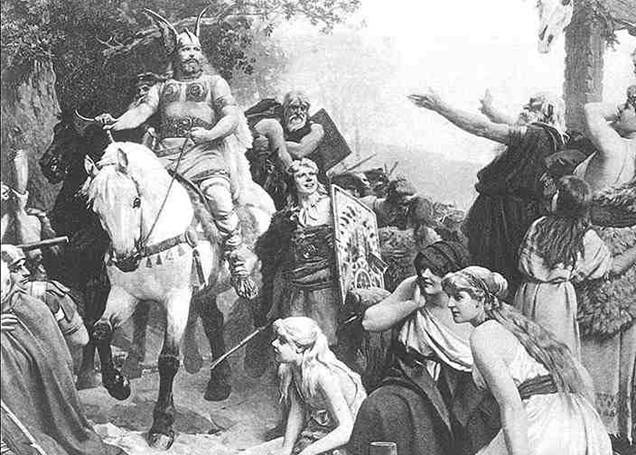 Wagner and his costume and set designer Carl Emil Doepler probably borrowed the idea not from the few scattered images of Vikings wearing horned helmets, but from the costumes in stage plays about ancient pre-Viking Germans. 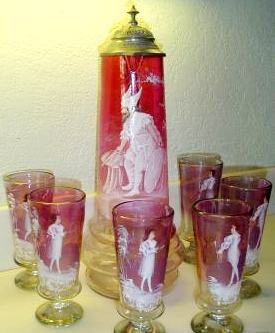 Another Theresienthal glass serving stein, and set with all white enameling of Hermann with the matching glasses. Circa 1890. “The Invention of the Viking Horned Helmet” by Roberta Frank in InternationalScandinavian and Medieval Studies in Memory of Gerd Wolfgang Weber (2000), edited by Michael Dallapiazza et al. “The Origin of the Imaginary Viking” by Johnni Langer in Viking Heritage Magazine, December 2002 –SDSTAFF bibliophage Straight Dope Science Advisory Board.